Blogger Andrew Loh who went for a quadruple by-pass surgery has been sharing his experience with members of the public, and in an earlier post, he said that he was appreciative of the government subsidies and Medishield Life. Mr Loh advised his readers who do not contribute to Medisave (and those that do not have enough in Medisave) to find some way to contribute to it. 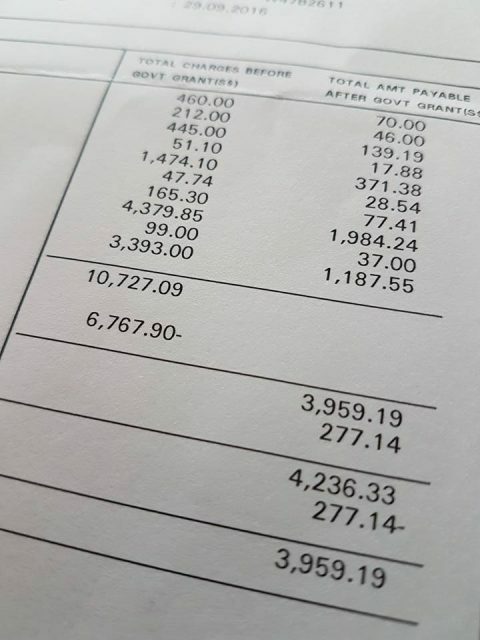 In a new post in his Facebook today, Mr Loh shared his finalized bill for an angiography he had before the major surgery. “Before gov’t grants/Medishield Life/Medisave/Private Insurance = $10,727.09. Net amount payable (before Medishield Life, Medisave and insurance) = $3,959.19. “I’m a little surprised Medishield Life pays only $720,” he said. But said that the bill is still manageable with further deductions, which will be made from Medisave and personal insurance. Mr Loh made a correction that the $10k bill was for an angiography and not for a quadruple bypass surgery. We have edited the article accordingly.